PARIS -- The exit of Renault SA's chief operating officer Patrick Pelata over a botched espionage investigation, threatens the French company's plan to reverse sagging European sales and expand in emerging markets, analysts said. 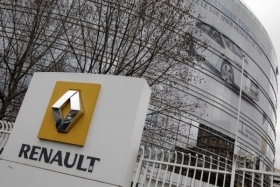 Pelata's resignation, announced April 11, leaves Renault without a permanent operational boss as it seeks to restore its core car-making business to consistent profitability and pursue sales and profit targets announced eight weeks before his departure. "The biggest challenge for Renault is to sort out its core brand and stop losing market share in Europe," said Philippe Houchois, an analyst at UBS AG in London. "Whoever replaces Pelata, the issue is that there appears to be no succession plan in place, so it won't be a smooth transition. While Renault's no-frills Dacia unit has enjoyed buoyant sales, the namesake brand's share of west-European registrations has averaged below 8 percent over the past three years versus almost 11 percent in 2002, Association of European Carmakers data shows. The company is counting on revamps by design chief Laurens van den Acker and a push in emerging markets to achieve 3 million sales and a 5 percent operating-profit margin in 2013. "Renault has set itself targets that would have been difficult even with a stable management team," said Albrecht Denninghoff, a Frankfurt-based analyst at Silvia Quandt Bank. The COO's departure "is bound to delay some important decisions" and disruption at Japanese affiliate Nissan Motor Co. after the earthquake and tsunami makes it "even less likely that Renault will meet the targets," Denninghoff said. Renault may say that first-quarter sales rose 4.7 percent to 9.5 billion euros when it reports figures later on Tuesday, based on the median of six analyst estimates compiled by Bloomberg. PSA/Peugeot-Citroen SA, Renault's larger domestic rival, beat expectations April 20 with a 10 percent gain in sales. Renault analysts published their estimates before the PSA report. Renault holds its annual shareholders meeting in Paris on April 29, when CEO Carlos Ghosn may face questions on his handling of the spying affair and the appointment of a replacement COO. Pelata, 55, stepped down in the face of pressure from the French government, Renault's biggest shareholder with a 15 percent stake, following the carmaker's admission that it wrongfully fired three senior managers. An internal investigation had concluded incorrectly that the three men received payments from Chinese companies via foreign accounts. Renault's new growth and earnings goals, issued on Feb. 10, compare with 2.63 million deliveries and a 2.8 percent margin last year and replace targets missed in 2009, when CEO Ghosn had pledged to lift profitability to 6 percent of revenue and sales volumes to 3.33 million units. "Whoever takes over from Pelata will have a lot of live issues to pick up," said Florent Couvreur, an analyst at CM-CIC in Paris. As a result, the recovery plan may be "pushed back by six months to a year." Renault shares have fallen 12 percent this year, the second-worst performance on the 14-member Stoxx 600 Automobiles & Parts Index, valuing the company at 11.3 billion euros ($16 billion). French rival PSA is up 2.3 percent. Ghosn, who splits his time between Renault and Nissan, refused Pelata's resignation last month, saying it would "add crisis to crisis" after the March 11 quake. Renault owns 43.4 percent of the Japanese automaker. Disruption at Nissan, which has postponed the reopening of the Iwaki engine plant, "will make a sizable dent" in its contribution to Renault's accounts for 2011, according to Barclays Capital analyst Michael Tyndall. Renault said Pelata's exit and "dysfunctions" uncovered in an audit of the spy scandal need not distract management. "We do have to find new ways of working as we replace Patrick Pelata, but our roadmap for 2013 and 2016 is well established and won't be affected," Gerard Leclercq, the head of manufacturing and supply chain, told journalists this month. Not all analysts expect Pelata's exit to hamper the company's recovery. Jose Asumendi at RBS in London, said the automaker should still meet its 2013 goals on demand for less costly autos. "I respect Pelata's work, but I don't think the company is going to be distracted by this," he said. "Whereas the previous plan was a risky bet on larger vehicle categories, the new one is much better because it leverages what they already do well." The French automaker has "several possible internal candidates" to replace Pelata, Ghosn said April 13 in comments to Les Echos that were confirmed by Renault spokeswoman Caroline De Gezelle. The company has nothing further to add, she said. Pelata's deputy Philippe Klein, CFO Dominique Thormann and Nissan North America chief Carlos Tavares are all in the running, La Tribune reported the same day. Sales chief Jerome Stoll was also identified as a candidate in an April 20 report by French business magazine Challenges. Klein, 53, recruited as an engineer in 1989 and made head of product planning in 2008, has held strategic rather than operational roles, while Thormann, 56, has occupied financial posts since joining from Chase Manhattan Bank. Shifting the CFO isn't the obvious move, CM-CIC's Couvreur said. "He's very smart and would do a good job, but you need someone with operational fiber, somebody like Tavares who has held posts in sales and manufacturing," the analyst said. Tavares, 52, joined Renault in 1981 after graduating from France's Ecole Centrale. As a Nissan executive he could also help deliver more synergies from the alliance, said Tyndall of Barclays Capital, though the move might have to wait until the Japanese company has dealt with its production crisis. "Pulling Tavares out at this point might be the wrong thing to do," the London-based analyst said. "I wouldn't be surprised if we saw a handover later in the year."